Often times you hear about basketball phenoms who started playing the game before entering primary school. Naturally, when you start young, the chances of success are bigger and there is no denying that. Here is the tricky part. Every child is influenced by his parents and you want your kid to grow up being interested in basketball, you have to start at a young age. All infants (not literally) love to play and they depend on it to develop the motor skills. Basketball involves all parts of the body and it is one of the easiest sports to get a kid interested in. The reason took a detour in the subject matter is simple: this is all quite known to the general public. Even toy manufacturers recognized the value parents put on basketball these days and they offer a wide range of toys and equipment to exploit that. This is one of the main reasons why I decided to create a detailed guide for parents looking to get their kids interested in basketball. All of these have important roles in the development of both skills and the desire to play basketball. Some of them might sound silly to you, but this isn’t an exact science. I simply collected all the data I could find on the subject matter, implemented my own experience and tried to come up with the best products out there. This is basically a guide to basketball hoops for kids and without further ado, let’s get into it. Here is best rated systems for your kids to play. Each of them have own pros and cons, so pick one that will serve the purpose for you best. The love of the game can be developed as soon as your kid starts walking on his own. This basketball hoop is designed for kids ages 1-5 and it really represents a perfect introduction to the world of basketball. First of all, it features oversized rim and a junior size basketball. This is important as you want your kid to score easily. Development is a result oriented type of progress. That’s why this hoop is so successful at aiding the social and motor skills development as well as overall coordination in kids. Simply watch how your kids face lights up every time he scores and you will better understand why this hoop is a perfect stool-step. The height of the hoop is adjustable (2-4 feet) and as your kid grows, you can increase the height in order to stimulate his progress. You can also weight the base with sand in order to increase stability. Build quality is good and kids will have a hard time busting this one. From what I was able to gather about this hoop is that kids really enjoy this one. The adjustability makes it challenging and therefore interesting to kids, and many buyers actually stated that it is the favorite toy for their children. And let me tell you this, in the digital age when kids prefer video games to actual sports, this is a really good thing to hear. Finally, you can get this hoop for less than $30 and use it for a couple of years. That makes it an excellent investment into your child’s development. 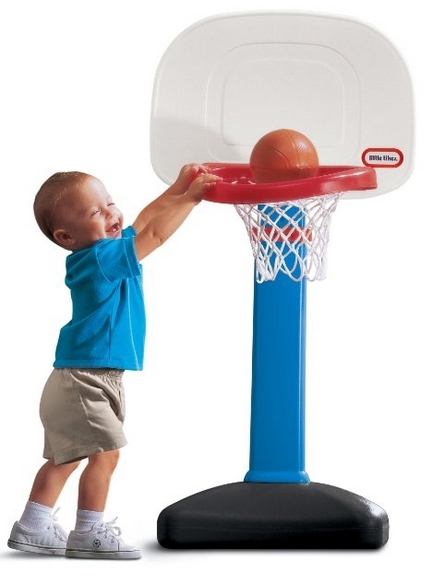 If you are looking for a hoop for your child’s first basketball steps, you will hardly find a better one than Little Tikes Easy Score Basketball Set. It is well built and really affordable. Highest recommendation. The next step in the evolution of a future basketball player involves increasing the challenge. This hoop still features a rim that is considerably bigger than the ball, but you can adjust it to greater heights. Step 2 Shootin’ Hoops basketball set is a bit more durable than a previous entry on this list and it can serve as the first hoop to teach the kids about the backboard. With adjustable height for up to 48″, you can lift it out of reach for dunking and force the kids to learn about shooting. It also features a base that you can fill with water or sand in order to anchor the hoop and make it stable. There is a neat feature on the base in the likes of 2 cup and water bottle holders. This hoop also features break-away rim that keeps it from breaking, but this could have been handled a bit better. This is far from being a viable hoop for anything serious, but the kids seem to really love it and find it amusing all the way up to 5 or 6 years of age. A real woven net comes with this hoop as well as a 6-inch basketball. The reviews and testimonials of the internet are exclusively positive and a 4.6 average user rating confirms that this really is a smart purchase. For as low as $40 you get a really durable hoop that kids can use for years. If you are looking for a hoop that will offer a challenge to your kids, this is a smart purchase. That being said, this is still a toy and cannot really be considered as basketball gear. We came to the first hoop that will really place a focus on shooting and the technique rather than pure play. Franklin Sports Shoot Again hoop is a first one on our list that features a real rim, not a learner’s one. In addition to that, this is also the first hoop with a spring mechanism on our list. This is basically an indoor dim that you can mount in the door. It features an easily mountable system that also supports height adjusting. This is important in order to increase the challenge as your child grows taller. 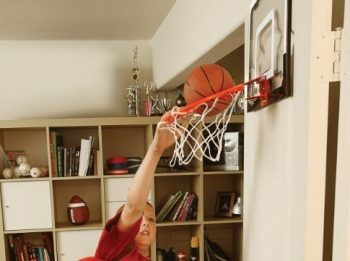 The spring loaded break-away rim is also designed to teach your kid about basketball in a realistic fashion and it serves a double purpose of protecting the rim from being broken when kids dunk on it. The backboard is big and solid and it offers a consistent bounce. Whereas the previous hoops from our list are considered to be toys, this one can actually be a tool that can teach your kids important lessons needed for professional playing. An especially cool feature is an electronic scoring system on the top of the backboard. This will instill the sense of competitiveness in kids and set them on a right path. Based on the reviews I found on the Internet, and having tested this rim on my own, it is safe to say that Franklin Sports Shoot Again hoop is a really smart purchase. It offers excellent quality and plenty of features and all that for a reasonable price. This is a definite buy if you are looking for an indoor hoop for your kid. It is fun, affordable, and to be honest, can be used all the way up to 10 years of age, easily. As you can notice, we are slowly transitioning from hoops designed for kids to have fun to the hoops designed to teach kids basketball fundamentals. SKLZ Pro Mini Basketball hoop is the first one on our list that is not really designed for pure fun. Actually, this is a hoop that focuses on delivering a true basketball experience in your kid’s room. It comes equipped with a spring loaded break-away rim and 18″ x 12″ shatterproof backboard. And considering the specs, you can safely say that this is actually a hoop that can be used by adults as well. The backboard is solid and offers bounce consistency, the rim is mad of solid iron and the heavy duty woven net should last you for at least a couple of years. That being said, kids are the ones who will get the most kick out of having one installed in their room. The bottom side of the backboard is foam padded and shatter proof board offers extra safety and a piece of mind. This is important to know because as the kids get older, they like to dunk and do cool layups, so having these extra security features really contribute to the overall quality. User feedback is exceptional and all the reviews on the internet are predominantly positive. A 4.5-star average user rating only goes to prove that SKLZ Pro Mini Basketball hoop is popular among the kids and adults alike. All the features and testimonials confirm that this is a high-quality product, but what really sets it apart from the competition is extremely competitive price and that makes it an excellent buy. Looking to transition from the indoor to the outdoor hoops, I would really like to mention this model. Most of the outdoor hoops are designed to improve the skills and cannot be considered as a toy with a sole purpose of entertaining kids. Now before we get into the hoops that offer features incorporated in professional basketball, let me just include Little Tikes Play like a Pro set on this list. 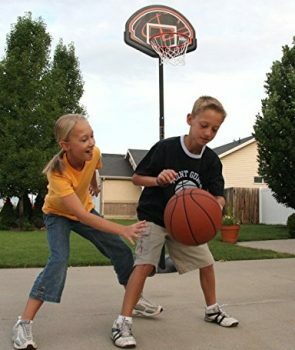 This is an outdoors hoop designed for kids to play the game with dribbling and rules while still providing the ease of scoring. It does that by combining the learner’s rim (considerably bigger than the ball) and the ability to lift it way beyond the reach of kids. So basically, kids are forced to shoot and drive but are awarded an easy enough way of scoring that will keep the motivated. That is an excellent combination if you are looking for the first outdoors hoop for your kids. Adjustable height will guarantee that there is always plenty of challenge for them. Looking through the user testimonials I came to a conclusion that this is a very well built and highly popular hoop set all over the world. And for a basketball hoop that can be used for years, the price is really not an issue. You can also order extra balls directly from the manufacturer at a really good price. Failing to believe in my conclusions, you should consider that last time I checked an average user rating for this hoop is 4.7 stars. For that price it is a good choice, you will hardly find a better deal for an outdoors hoop set that will keep your kids interested and challenged for a couple of years. Great purchase. This is the point where we introduce hoops that are used with real basketballs. 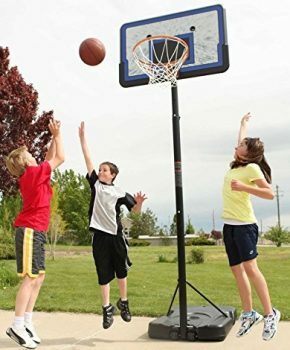 Lifetime 90022 Youth Height-Adjustable Portable Basketball System is an outdoors hoop that transcends the realm of toys and is a hoop that is designed to offer a real game feel to your kids and for adults as a matter fact. This system features adjustable height (5.5 to 7.5 feet in 6-inch increments), a solid backboard with padding on the bottom side, and a reduced size 15″ rim. So the challenge for your kids is real and it is close the one they will face playing professional basketball. The whole system is designed to be rust and weather-resistant so that you can leave it outdoors for prolonged periods of time. The base can hold up to 10 gallons of sand or water that provides good stability while keeping it portable. I especially like the reinforced rim that offers quite a bit of rebound. Having tested this hoop myself, I can safely say that this is certainly a smart purchase. But you don’t have to take my word for it. It won’t be hard for you to look up one of dozens of positive reviews on the Internet that bolster my claim. 4.3 star average user rating can testify to the quality and the popularity of this model. Lifetime really struck a good balance of price and quality with this system. In fact, Lifetime even offers a 5-year limited warranty that is rarely seen with this type of systems. This is the rim that will serve its purpose extremely well and will offer all the proper challenges your kid needs in order to develop real basketball skills. If he grows up to be a professional basketball player, much of his success will be traceable to this hoop. 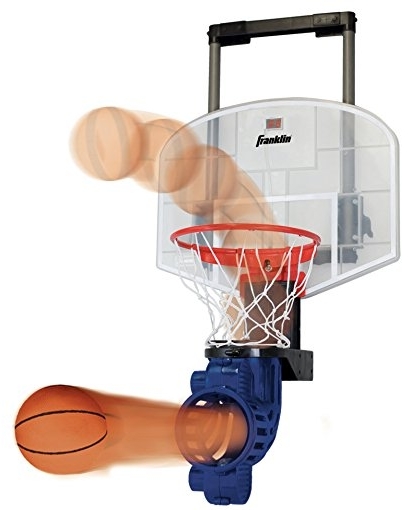 Apart from purchasing a portable hoop costing hundreds of dollars, or installing a stationary one in your backyard, this is the closest (for under $100) thing you can get for your kid to practice and hone his basketball skills. 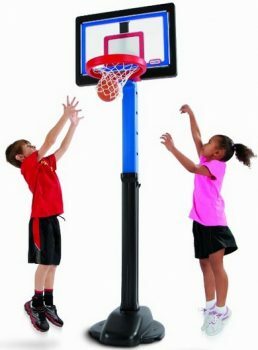 Lifetime 1221 Pro Court Height-Adjustable Portable Basketball System offers many of the features stationary hoops do and definitely deserves your attention. It features a telescoping mechanism that allows you to adjust the height from 7.5 to 10 feet in 6-inch increments. Add to that a break-away rim and a huge 44″ backboard and you have yourself a real hoop. Other features include weather and rust-resistant coating that will protect it from the elements and allow you to have it deployed outside for prolonged periods of time. This is a mobile hoop that you can roll around and install almost anywhere and a 27-gallon base will make sure that it is stable once you set it to the desired location. The base can be filled with water, sand or gel. This is an outdoors hoop that you can install and adjust according to replicate the court settings your kid competes on. It offers all the challenges a kid needs to master in order to become a professional basketball player. Furthermore, this hoop is not solely designed with kids in mind. 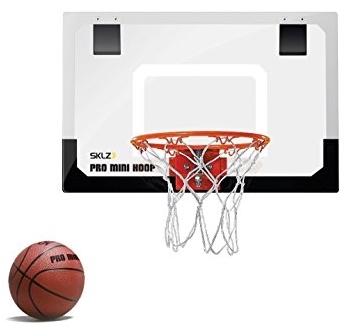 Adults can also use it to play pickup games without any issues and short hang dunks, you will hardly even notice that this is a portable hoop. Padded backboard and a limited 5-year warranty only go to prove that this is a serious and yet affordable hoop you can have in your backyard. See our more detailed review for more information. Not made for dunking of any kind. If you are looking for a hoop that will satisfy the needs of pickup games and offer your kids a chance to improve his skills, all under $100, look no further, this is the best option by far. Hopefully, this guide gave you some inside into what your options are. Basketball hoops for kids is a category that offers a lot of different options and the competition is tough. These are not the hoops that offer the best features, nor are they the cheapest ones on the market. These are simply the ones that offer the best compromise between the price, quality and usability. One thing I would like to encourage you is to, whenever possible, try a product out before purchasing. Short of being able to do that, rely upon the guides like this one. I tested a lot of these products myself and where there were no conditions to do that, I reached to users who did and got their first hand experience. Basketball is a beautiful game and your kids will love any of these products. Depending on their age and the level of skills, all of these will contribute to their development and help them learn the necessary skills to become professional players some day.